Browse > Home / Arsenal FC, Champions League / Indian Summer or Greek Salad? Indian Summer or Greek Salad? Next up, Olimpiacos, who despite being a relatively well known Greek side, appear to have less internet column inches or video minutes devoted to them than chipmunks that look a bit “tasty”, or is that a hamster and who really cares anyway?! So, given the wealth of information regarding the most successful club in Greek history, sporting a trophy cabinet containing no less than 38 league titles, 24 Greek cups and 4 Greek Super Cups, it appears that focusing on our part ot be played in this match is my only real escape route! Unfortunately, with the number of injuries alone that we are carrying, there is sufficient there to cover the blankest of pages! The list of casualties is again starting to make it look like opening a private hospital may have been a better choice than a shiny new stadium! Incredibly our brand new centurion, Rip-Roaring Rocking Reliant Robin, is STILL fit and, with the list above, we are certainly going to need him to continue in his rich vein of form. In terms of a starting XI, a lot of the “selection headaches” that Arsene Wenger surely cannot wait to experience, are currently not even enough to warrant a junior aspirin! Of the players that are available and competing for a place, I expect that Gibbs will continue to get the nod over Santos as he played in the defence that presided over that rarest of occurences at the Emirates of late, a clean sheet! Rosicky, if he is at a sufficient level of match fitness will probably win the battle to “partner” Van Persie leaving the bench-warming to Park and Arteta will probably get moved out to the right being preferred to Oxlade-Chamberlain. The one big issue is who will partner Mertesacker in the centre of defence, as we currently have 3 centrebacks out injured. 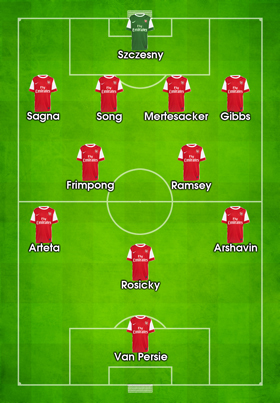 The obvious choice would be to put Song in there and throw Frimpong into the defensive midfield berth although there is a slim chance that Wenger could surprise us and go with either Sagna in the centre and Jenkinson at right back or even bring in young Ignasi Miquel. In truth, it may well be a little early for Miquel in general and the careful and necessary “rehabilitation” of Jenkinson after the Manchester debacle will probably continue so I think that Song will start in what could well turn out to be a crucial match once the dust settles on this Champions League group. All in all, not a bad side, and further proof that the squad is not as lacking in depth as some quarters would have you believe. That said, we cannot afford to “expect the win” as some are also claiming. Whilst there isn’t a huge amount of interesting informtion regarding the Greek champions, I can tell you that a number of their players in the forward positions can and do score goals regularly and, if we give them too much space or switch off for even a second, we could be severely punished. I can also tell you that Olof Mellberg, the ex-Aston Villa centre-back, is currrently enjoying some good reviews in a defence that is not going to give away too many freebies. Add to this the fact that they were beaten by Marseille at home last week and it is safe to say that they will not be coming to London to make up the numbers as they look to rebuild their Champions League campaign. The obvious defenciency in their team is a general lack of particularly mobile players, especially in central midfield and defence, so if we can get our passing game going we may see them fade quite dramatically the last third of the match. In terms of our own game-plan, well, that should be fairly straightorward. We will need Song to sit tight in defence, playing as close to Mertesacker as Koscielny did against Bolton and Frimpong will need to do the same job that Song has been doing in terms of breaking up the attacks before they get too close to our penalty box, a job which young Alex appears to be growing into with every passing game and all credit to him for sticking at it and becoming the player that many believed he would never be after a difficult start to his Arsenal career. We will also need Ramsey to pick up where he left off on Saturday during which match he finally started to show glimpses of him ability to produce some delightful defence-splitting passes to go with him phenomenal work-rate. The real worry for me is that our side also lacks a little pace. To counter this we will need not only a continuation of that direct passing, so effective against Bolton at the weekend, but we will also need to see Arteta and Arshavin getting forward quickly and making runs in behind the defence to providing the outlets for those passes as were Gervinho and, more impressively, Walcott on Saturday. A little confidence in the defence could go a long way and we can but hope that the clean sheet we kept inspired the defence to put in a few extra hours on the training pitch over the past few days to continue to practice the things that are clearly helping them to go in the right direction. In terms of a scorline prediction, I will go with the same result that I thought we would see against Bolton, 2-0. Above all I think that a level of patience will be required, both on the pitch and off of it. The Greeks are not going to be throwing caution to the wind and leaving huge holes in their defence and the last thing our players need will be to start feeling the pressure cascading down from the stands. Olimpiacos surely realise this and will undoubtedly set out to stifle our attacking game and maybe even sneak one on the counter. As I eluded to earlier, I believe that the last 20 minutes of this match is where it will be truly decided and the fans will need to understand that and stay behind the team, even if, Dennis forbid, we find ourselves a goal down going into the final third of the match. Should we find ourselves a goal up, the need to calm things down and concentrate on keeping the ball for long periods to wear down the Greek legs will be of massive importance. Three points is the target and another clean sheet would also be nice. Of least importance is the attractiveness of the football that gets us to those targets so let’s just get behind the boys and stay behind them right up until the final whistle. With the injury list that we have, a twelfth man could be more decisive than ever. The tabloids and some sections of the fanbase have chosen to draw their swords over the Jack Wilshere injury situation, claiming that the Arsenal medical team have “again” bungled a players care. I have to say that I do not agree with this opinion. The decision to let Jack wear the medical boot and to see if the injury would heal naturally was taken to give Jack every chance of recovering without having to have surgery at such a young age. A risk that obviously hasn’t paid off, but I think it was a risk worth taking and all of the absurd conspiracy theories flying around in the wake of this are becoming more and more absurd by the minute. I think that it is safe to say that “those who shall not be pleased” will do anything to find a way to criticise the club right now, but claims that Jack failed a dope test and the FA are enforcing a period of time off rather than an official ban is about as low and ludicrous as this whole absurd saga can possibly get…Isn’t it? Come on Gooners! Let’s at least try to remember that, at the end of the season, should a trophy find its way into the trophy cabinet and a queue of players forms at Wenger’s door ready to sign their contract extensions, the vast majority of us will be as happy as pigs in poo, claiming to a man that we always knew Arsene would turn it around! Of course, there will be a section, an underwhelming minority, that will be unhappy that they didn’t get to set the manager on fire at the end of the season. For the moment the transfer window is closed, Arsene is the man in the job and changing that right now would surely be a foolish move and the best thing that we can do is to stop the bickering and bleating and just get behind the team. January will be here soon and, with Tevez reportedly likely to never play for Manchester City again, I am sure that we will have to deal the tabloids spewing out enough Van Persie to Citeh stories to last a lifetime. The last thing we need is to go into that period with players feeling like there is nothing they can do to please the fans. It would just be an added incentive for them to leave and all the blood that the media sharks would need to smell to get the fires burning under this story alone. Arsenal Ladies did the club proud, yet again, by securing an historic treble adding the Continental Cup to their Super League and FA Cup successes beating Birmingham 4-1 on Sunday. Goals from Ellen White and Jaybe Ludlow before half-time and a brace from Ladies Legend Rachel Yankey proving enough to beat Birmingham into the runners-up position as they already did in the inaugural Womens Super League. Congratulations Ladies and good luck with your Champions League match against FC Bobruchanka of Belarusia on Thursday. And on that note, I bid you farewell and look forward to being able to write nice shiny positive things after the game today! Come on you Injury Ravaged Greek Bubble Bursting Gooooonnnnneeeerrrrsssss!